Suppose I am the principal of a school and there is a rule that there is to be no profanitiy /cussing /swearing. I write that rule on the board for all students to see, and the whole school sees and hears it. The penalty I announce, too: there is to be a spanking (yes spanking is biblically ok) if any one breaks the rule. Now, there is a boy named John Jones in my school, a boy I am fond of. At recess-time he swears. Everybody hears him; I hear him; everybody knows I hear him. When I call the school to order, all the scholars are looking at me to see what I will do. I bring my boy, Charles, out before the whole school, and I say, “This is John Jones whipping I am giving to my son Charles. The law of the school was broken by John Jones. I am putting the penalty on my boy. He says he will gladly do this for me, and for John.” Then I whip my son Charles; and I do not spare him. I whip him just as if he were John Jones, just as if he had broken the rule himself. Now he is reconciled from his side, to me. But you see I reconciled him to myself, first. I had to deal with his disobedience, or be myself unrighteous. Romans 5:10 For if, while we were enemies, we were reconciled to God through the DEATH of His Son, much more, being reconciled, shall we be saved in His LIFE. The Greek word for reconcile is katalasso which means to exchange. When a person believes the gospel of Christ and is born again, he passes from a position of enmity and alienation from God, to being reconciled and brought near to God. God is not reconciled, but man is. 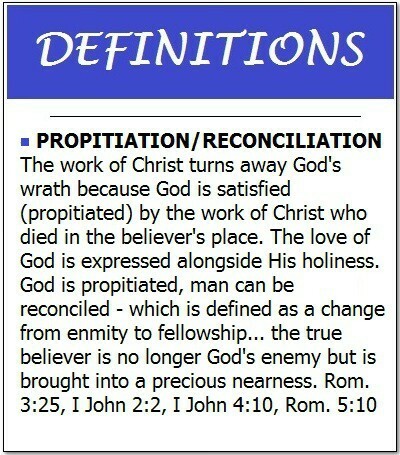 God is propitiated/satisfied by the work of Christ, but man is reconciled by that same work.